An abandoned stimulus sign is symbolic of the failure of Obama's economic agenda. Composer Irving Berlin penned those words as an introduction to the patriotic song “God Bless America” in 1938. In that year, Americans surely felt the need for God’s blessings. As Berlin noted, war clouds were gathering across both oceans that lapped at America’s shores. Beyond the Atlantic, Adolf Hitler has assumed power in Nazi Germany and began to rebuild the German military in violation of the Treaty of Versailles. That year Germany annexed Austria and Czechoslovakia’s Sudetenland as other European leaders followed a policy of appeasement. Kristallnacht, a night of coordinated attacks and pogroms against German Jews also took place in 1938. To the west, across the Pacific, Japan was also violating the London Naval Treaty which restricted the number of warships in its Navy. Japan had already captured Manchuria and Shanghai in China and was attempting to conquer the rest of the country. In 1938, Japan announced its intention to form a New Order for East Asia and to dominate the region. By 1938, Josef Stalin had turned the Soviet Union into a police state. In power since the death of Lenin in 1922, Stalin had already purged the Soviet Union not only of his enemies and foreign immigrants (including thousands of Americans who had fled the Great Depression), but many of his allies and innocent people as well. Stalin’s policies also led to massive crop failures and famines that killed hundreds of thousands more. In 1938, the situation at home was not well for the United States either. The Great Depression had begun in 1929 and had worsened under the watch of President Franklin Roosevelt. By 1938, Roosevelt’s policies of tax increases, high levels of government spending, and more regulation on business had turned a slow recovery into a second recession within the depression. The country’s economic difficulties spurred strict immigration laws and an isolationist foreign policy. In many ways, the world and America of 2011 strongly resembles the world and America of 1938. Hostile dictatorships are rising around the world as our federal government attempts to legislate its way out of an economic crisis that was caused in part by reckless legislation in the first place. The most obvious threats are in the Middle East. 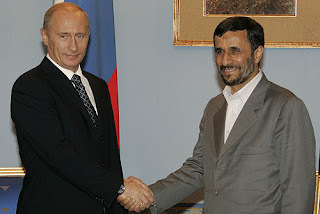 President Ahmadinejad of Iran is nearing the end of a nearly decade long push to develop nuclear weapons. Iran recently unveiled underground missile silos that reportedly accommodate medium- and long-range nuclear missiles that could possibly reach Israel or beyond to Europe… or possibly even the United States. There is little doubt of Iran’s hostility to the United States. In June 2011, Defense Secretary Robert Gates announced that Iran is renewing arms shipments to Shiite terror groups in Iraq as American soldiers prepare to withdraw. Gates attributes forty percent of U.S. troop deaths over the past ten months to the Iranian arms shipments. After the breakup of the Soviet Union twenty years ago, the Russian Empire is now resurgent under Vladimir Putin. Putin has reversed many of Russia’s democratic reforms and killed and imprisoned dissidents and journalists, both at home and abroad. In a case worthy of a James Bond film, Alexander Litvinenko, a former Russian agent living in exile in the U.K., was poisoned with a radioactive substance. It is widely suspected that Litvinenko was murdered on Putin’s orders. Putin has also leaned on other countries. He has attempted to strong-arm the Ukraine and has cut off the flow of gas through pipelines from Russia. Putin’s Russia is also suspected of using poison to try to assassinate Viktor Yushchenko, then a Ukrainian presidential candidate. The poison left Yushchenko’s face scarred, but he survived and is president of the Ukraine today. More overtly, Putin’s Russia invaded the central Asian country of Georgia in 2008. Russia captured two disputed areas in Georgia, South Ossetia and Abkhazia, and occupies them to this day. Putin, who was director of the Federal Security Bureau, the successor agency to the K.G.B., is also widely considered to be largely responsible for the brutal Second Chechen War. Under Putin, Russia has also been beaming slickly produced propaganda to the U.S. via the RT television network. Like the Americans of 1938, the Americans of 2011 have become increasingly isolationist. The Americans of the 1930s had not been at war for the past decade, but they had witnessed a twenty-five year occupation of Haiti, a twenty-one year occupation of Nicaragua, a sixteen year occupation of Cuba, and numerous other interventions in Central America as well as having troops in harm’s way in China. As in our own age, war weariness likely combined with poor economic conditions to cause many Americans to embrace and isolationist view. The America First Committee was made up of many prominent Americans who believed that the U.S. should stay out of foreign wars. The isolationists opposed even sending military aid to the countries fighting Hitler, believing that America was safe from foreign attack. The America First Committee was disbanded four days after the Japanese bombed Pearl Harbor, but their actions left the U.S. military woefully unprepared for war and emboldened aggressor nations. Today, the wars in Iraq and Afghanistan have sapped much of America’s strength. After 9/11, most Americans supported a broad war against the terrorists and believed that failure to take military action was a bigger risk than doing nothing. Now, after the death of Osama bin Laden, almost three-quarters of Americans support President Obama’s plan to withdraw from Afghanistan, leaving the country ripe for a Taliban resurgence. Americans now oppose the war in Iraq by a two-to-one margin, even though leaving might mean that Iran could gain control of a large portion of Persian Gulf oil fields. Even though President Obama and the Democrats promised that the stimulus and a myriad of other government programs would cure the economy, the recovery has been slow. Even worse, recent economic indicators show that a double-dip recession is becoming more likely. For many Americans, the best that can be expected is “the new normal:” high unemployment, lower wages, and economic stagnation. In Georgia, the unemployment rate has been consistently above the national average during the economic crisis. That remains true, even though Georgia unemployment has declined slightly over the last few months while national unemployment rose. There are two lessons to learn from the America of 1938. The first is that, as President Reagan put it, when it comes to the economy, “Government is not a solution to our problem, government is the problem.” The attempts to control the economy by President Obama, and earlier by President Roosevelt, create uncertainty and discourage businesses from growing and investing. Increased regulation limits the ability of businesses to grow and become profitable. Higher taxes mean that businesses have less money with which to grow and invest. All of this means fewer jobs and economic stagnation.